Karen was brought up on a diet of old '78 records, Louis Armstrong, Cab Calloway and Dixieland ragtime. It's only to be expected that her performing career has had a heady influence of swing music. 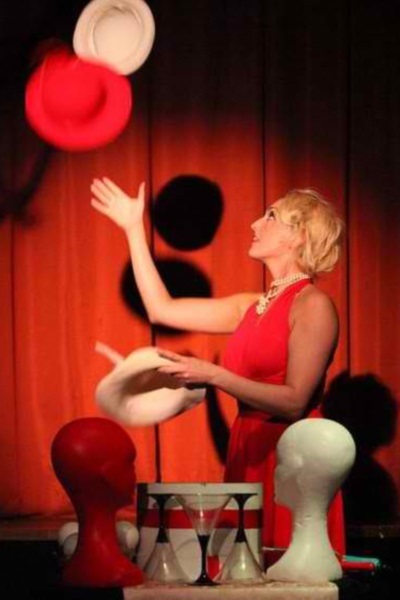 New to teaching swing, Karen has been teaching and performing circus for over 8 years. She also has to secretly confess that her Aunt and Uncle have taught rock and roll for over 15 years and there was more than one occasion that she donned a full skirt and petticoat combo and hit the dancefloor. Karen is actually a professional juggler and circus performer with her signature act set to 'It don't mean a thing if it ain't got that swing'. She looks forward to more performing experience in swing dancing in the coming years.